Beppie is our permanent volunteer on Lesvos. 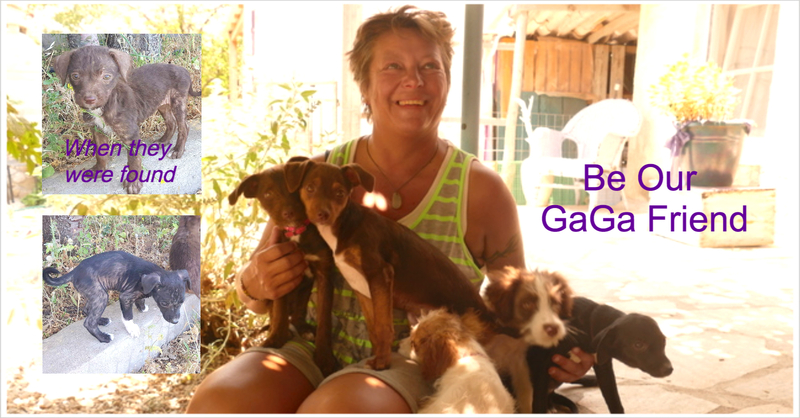 She tells how these lovely puppies ended up in our shelter. One day, we were driving around the island and came to this remote spot. After we had parked our car, we heard this squeaking noise. We found out it was coming from behind a wall. We didn’t hesitate and climbed over the wall. And soon we discovered a couple of fluffy balls and bead eyes looking up at us. We could also hear squeaking from another corner, where we found two more pups. But they looked awful. You could hardly tell they were dogs – I fact, they looked more like small rats. They were very thin and their skins were really bald and itchy – they just couldn’t stop scratching. The first thing we did was check out the area, but there was no one around. We only found a box and an empty bowl. We think it must have contained water, but that was long gone of course. We could not find the puppies’ mother either. The only thing we could conclude was that the pups were unwanted and had been dumped here. They had absolutely no chance of surviving without food or water. They must feel horrible with all that itching. We just couldn’t leave them behind, so we put them in the box and took them to the car. We immediately called Gerbien and a vet, and drove down to see them. All five pups turned out to be in bad shape, and they all had scabies. We bought shampoo and medicine to treat them. Scabies is a highly contagious disease, so we couldn’t put them with the other puppies. I had a puppy pen at home, which I used for puppies that were almost ready to be rehomed. So we used that to house these five. They spent two weeks in quarantine. We gave them their medicine and washed them with special shampoo every day, and changed our clothing and took a shower every time. The puppies also had to get used to human contact. At first, they shivered when I picked them up. Then they slowly became accustomed to it and started to enjoy the attention. Their skins became prettier and finally, they were all cured. So we let them out of their quarantine, and now they are enjoying life again. They have developed into open and sociable puppies and they look adorable! Once they have had their shots they will also be traveling abroad to find a loving and caring home! OUR SHELTER also has a place for pups like these. Unfortunately, puppies are often dumped under miserable circumstances. Their chances of survival are zero, because they are too young to look after themselves. These five were taken in by our volunteer Beppie, because they had to be kept separate from the others because of the risk of contagion. Once they are old enough and have their shots, we will let them with the other pups and start looking for a new home. HELP US help dogs such as Joy, Hope, Faith, Camel and Canon by donating 1 euro a month (no more and no less) and becoming a Teamer. With more Teamers we can help more dogs! ABOUT TEAMING This is a platform that supports over 8,000 social causes (groups) to facilitate micro donations of 1 euro. In turn, it receives support from businesses so it can make this possible. This means we do not pay any commission, so that every euro is fully spent on helping dogs in need!